After a long, tough day on the job, nothing beats relaxing in front of your huge flat-screen television to watch the newest releases from Netflix. And when you toss in your favorite beverage and a bowl of buttered popcorn, work problems magically disappear for the remainder of the evening. The only thing that could possibly improve this scenario would be the addition of home theater seating to your living room. Watching a movie from typical couches or armchairs just doesn't compare to the experience you get with home theater chairs. That's because today's home theater chairs are comfortable, stylish, and equipped with amenities not found in standard furniture. This is particularly true with regards to power recliners, which are quickly becoming the most sought-after home theater seating product on the market. Push-button recline. The reclining mechanism on automatic home theater chairs operates with the touch of a single button located conveniently on the armrest. This means you don't have to struggle with a lever or change your physical position in order to get the chair to move. Recline in any position. Unlike manual recliners that give you only two or three positions to choose from, power recliners allow you to recline at any angle. Simply push the button to begin reclining, and then release the button when you reach your desired position. Fast and smooth operation. These home theater chairs are made with the latest technology to ensure fast and smooth operation. You can go from the upright position to fully reclined in a matter of seconds without spilling any food or drinks you might have on the trays or in the cupholders. Handy accessories. As with most of the other home theater seating products we carry, our power recliners are available with a variety of standard and optional accessories, including LED cupholders, removable food trays, armrest storage compartments, and LED ground lighting. Being able to unwind at home while leaving the cares of your job behind is an essential part of maintaining your sanity. 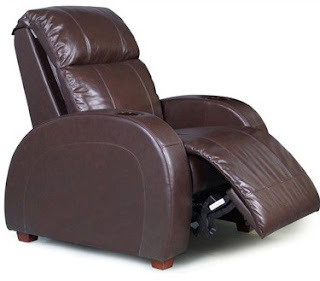 Make sure you're able to do this in unparalleled comfort and style by purchasing a power recliner from the home theater seating experts at TheaterSeatStore.com.